This brief article will look at the actions and casualties sustained by the 2nd Battalion Royal Dublin Fusiliers (part of 10th Brigade, 4th Division) during the Second Battle of Ypres. One often feel when visiting the Ypres Salient that the sheer horror of the Third Battle (Passchendaele), fought during the summer and autumn of 1917, can overshadow earlier clashes. Many first-time visitors may be unaware of the horrendous casualties sustained by the British in earlier desperate defensive battles (First Ypres – Oct-Nov 1914) and Second Ypres (April-May 1915). The latter battle saw the advent of chemical warfare when the Germans released chlorine gas on a four mile frontage in the late afternoon of 22 April against two French divisions defending the north of the salient. Gas also drifted across Canadian positions holding the left flank of the British. The initial success of this experimental weapon, which left a trail of dead and dying in its wake, enabled the Germans to advance from the fields around Poelcapelle and Langemarck to Steenstraat on the Yser Canal. The stalwart defence of the untried 1st Canadian Division (my grandfather, a private in the 13th Battalion CEF, amongst them) and the rushing forward of British troops to plug the gap around Ypres is not the subject of this article. However, this defence must be appreciated to put the specific story of the 2nd Royal Dublin Fusiliers into context. Not surprisingly, considering their initial success, the Germans used gas on a number of other occasions during the battle, culminating in the Battle of Bellewaarde Ridge on 24-25 May. 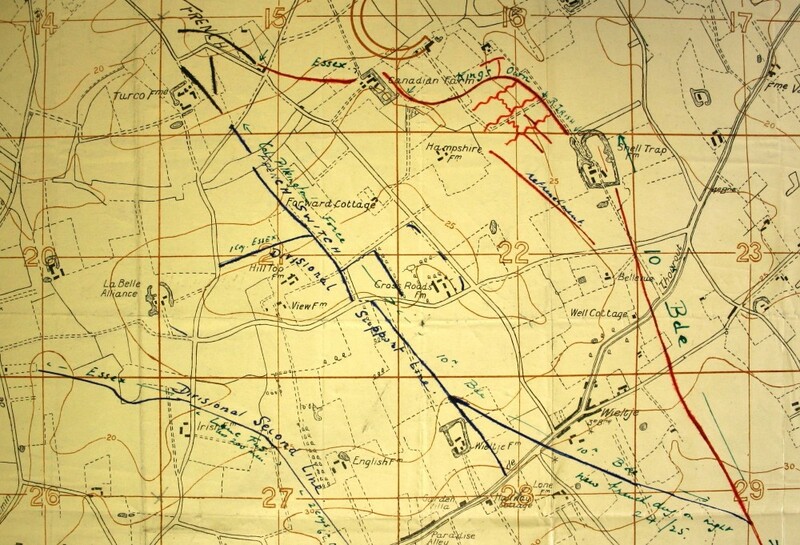 A terrifically detailed description of the opening phase of Second Ypres can be found here: http://www.greatwar.co.uk/battles/second-ypres-1915/index.htm. On 23 April 2nd Royal Dublin Fusiliers were told to stand by and be prepared to move at a half hours notice. 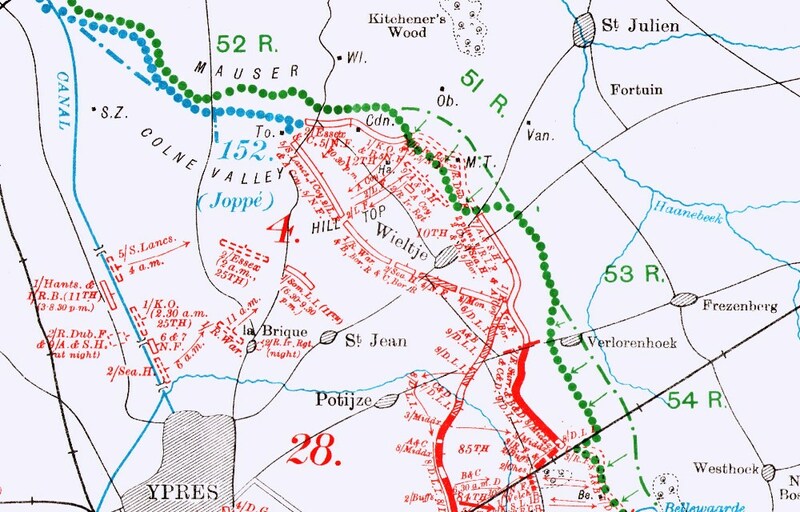 The following day they marched via Vlamertinghe to the outskirts of Ypres and at midnight to St Jean where they deployed west of the Wieltje – St Jean road at 4am. The Battalion War Diary records they suffered heavy casualties digging in on a line a quarter of a mile from and facing St Julien. There follows a ‘quiet morning up to 11am’ until the Northumbrian Infantry Brigade attacked through their trenches. During this period Captain Banks was killed, his command being assumed by Captain Basil Maclear. The War Diary records ‘heavy shelling throughout the day, and intermittent musketry’. There follows a few days of relative quiet which is shattered on 2 May when, in a foretaste of future action, the enemy attacked under cover of gas. Men of the left hand company were most affected but the German attack failed to reach the 2nd Royal Dublin Fusiliers trenches. After relief on 4 May the Battalion bivouacked on the east bank of the Yser Canal, a half mile north west of La Brique. This period away from the front line was shortlived as the Germans made a concerted effort to break the British line. 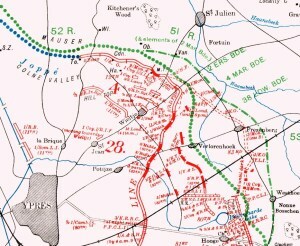 This attack, made against the 27th and 28th Divisions on 8 May, began what was named by the post-war Battles Nomenclature Committee, the Battle of Frezenberg Ridge. A violent German artillery bombardment caused terrible destruction to the British defences. Whilst avoiding this initial bombardment the 2nd Royal Dublin Fusiliers were warned at noon to be prepared to move forward to support 81st Infantry Brigade. Ninety minutes later the battalion (in fighting order) left their bivouac and joined the 1st Royal Warwickshire Regiment outside Ypres, moving to the wood by Potijze Chateau. Heavy shell fire was recorded throughout the afternoon and evening. On three separate occasions the Battalion deployed beyond the British barbed wire to assault the German trenches North of Potijze Woods. Each time the attack was cancelled. However, the body of men in the open presented an easy target for German machine gunners; the War Diary records that ‘machine guns did considerable damage’. To compound the misery the rations failed to arrive. That night the battalion occupied what was left of the GHQ Line, their left being 150 yards south east of Shell Trap Farm (later renamed Mouse Trap Farm), lying immediately north of the Wieltje – St Julien road. One company was held in reserve in trenches north of Potijze Wood. The War Diary describes 9 May as “One of the worst days shelling [the] Battalion experienced.” German machine gun and accurate sniper fire added to the difficulties. After a few days in these positions the Battalion was relieved, moving back to Vlamertinghe Chateau before returning to the trenches on 19 May. The War Diary records little of interest in the following few days other than intermittent shelling and sniping. The entry for 23 May records a “Quiet day and night”. The Dubliners were not know it but that quiet night was the calm before the storm. 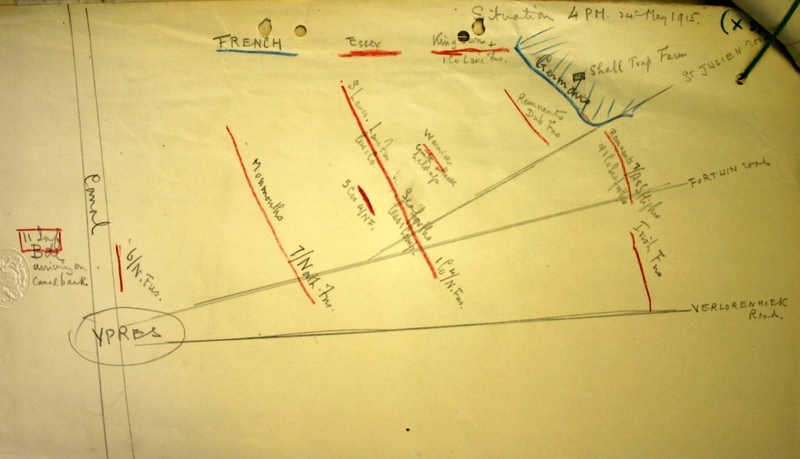 Detailed sketch map showing trench positions around Shell Trap Farm prior to 24 May gas attack. Image taken from 4th Division General Staff HQ May 1915 War Diay (NA Ref: WO95/1442) and is reproduced with permission from the National Archives. At 2.45am on 24 May the enemy attacked with gas. The area round Shell Trap Farm and to its immediate north west was most affected. A detailed report of the events of 24 May 1915 by Captain Thomas J Leahy (incorrectly transcribed as Linky in the report) is attached to the Battalion War Diary. Leahy describes that their C.O., Lieutenant Colonel Arthur Loveband has suspected gas may be used when inspecting the trenches at Shell Trap Farm earlier that night. He had personally warned all Company officers to be prepared whilst Major Russell (RAMC) had inspected all that Vermoral sprayers and warned each company about damping their respirators. 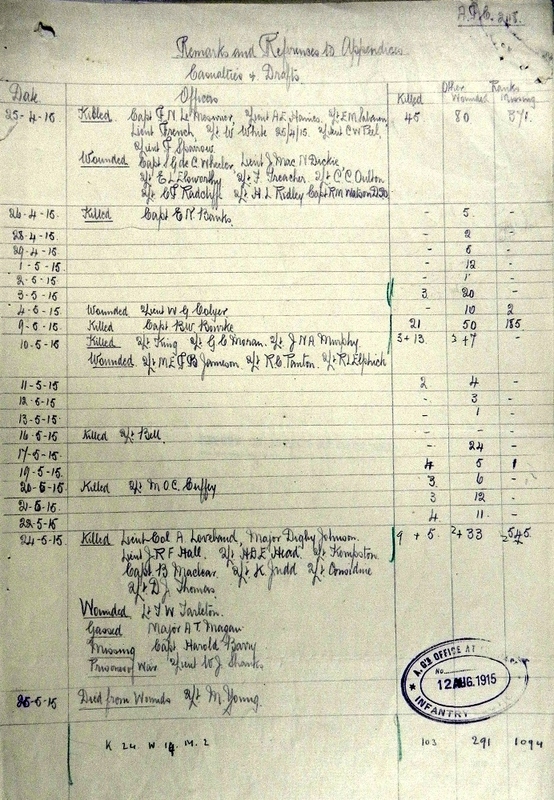 Leahy’s report notes there were ten sprayers in working order that night, one with each machine gun and the remainder distributed along the trenches. When seeing red lights thrown up from the German trenches (a signal for the gas release) Lt-Col Loveband shouted “Get your respirators boys, here comes the gas”. Leahy notes how little time they had; “we had only just time to get our respirators on before the gas was over us”. There was a gentle breeze, the gas cloud being very dense took about three quarters of an hour to pass over the Fusiliers’ position. German parties advanced in small numbers at 4.30am, occupying the British line north and to left of the Battalion’s trenches. With these trenches occupied, the Battalion was now subjected to enfilade fire. Under heavy shellfire and aided by part of two companies of the 9th Argyll & Sutherland Highlanders the Battalion held to their trenches to the end. The report makes harrowing reading, containing transcripts of signals sent by isolated parties within the farm complex. Even a hundred years after the event it is clear to sense the fear in 2nd Lieutenant Robert Kempston from B Company’s message which simply stated “For God’s sake send us some help. We are nearly done”. Kempston was killed later that day. Whilst speaking to officers outside his dugout Lt-Colonel Loveband was also killed when a bullet struck him through the heart. Sketch map showing situation at 2.45am on 24 May 1915. 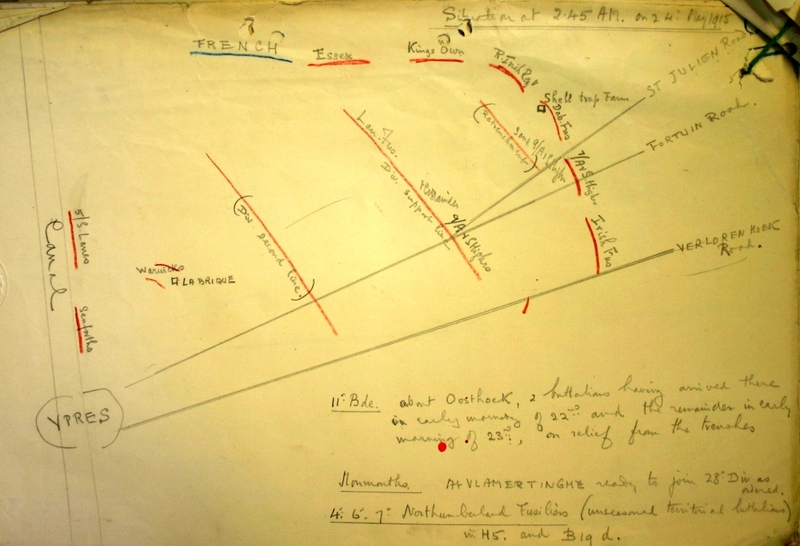 Image taken from 4th Division General Staff HQ May 1915 War Diary (NA Ref: WO95/1442) and is reproduced with permission from the National Archives. The War Diary records “Germans advancing under cover of enfilade fire, in small parties, finally occupied Battalion line by 2.30pm. Shelling ceased but rifle and M.G. fire remained accurate and constant, whenever a target presented itself, until dusk.” In the face of such a breakthrough it was decided, that evening, to withdraw to a more defensible line. Exhausted by their staunch defence the Battalion was withdrawn at 9.30pm and bivouacked on the west bank of the canal. Sketch map showing situation at 4pm on 24 May 1915 after German gas attack. Image taken from 4th Division General Staff HQ May 1915 War Diary (NA Ref: WO95/1442) and is reproduced with permission from the National Archives. 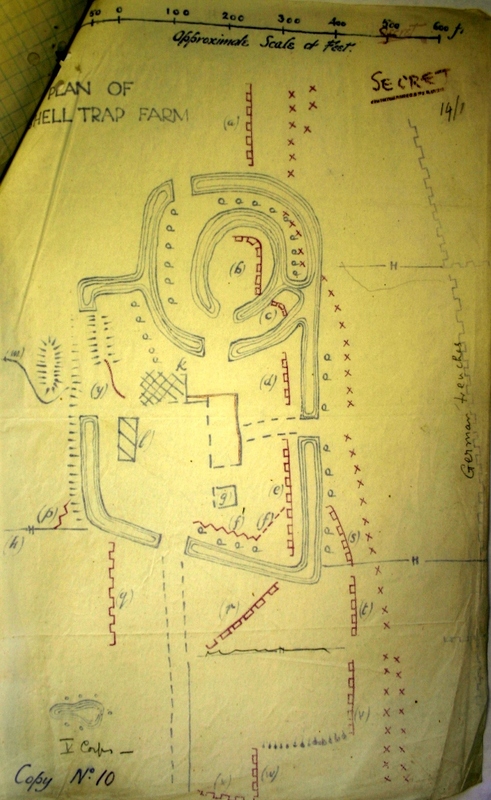 Trench map of positions around Shell Trap Farm. 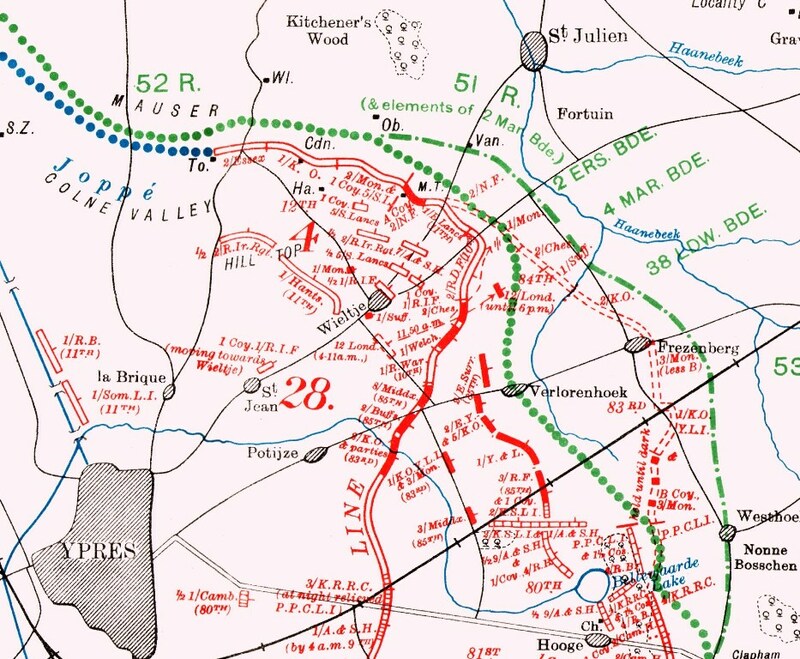 Red lines show the trench positions prior to the 24 May gas attack whilst the blue lines correspond to final positions after the attack. Image taken from 4th Division General Staff HQ May 1915 War Diary (NA Ref: WO95/1442) and is reproduced with permission from the National Archives. The War Diary records the Battalion strength in trenches on the morning of 24 May was 17 officers & 651 other ranks. Such had been the ferocity of the fighting, the shellfire, rifle and machine gun fire with the addition of the night-time chlorine gas attack that, when relieved, only one officer and 20 other ranks crossed the canal. What remained of the Battalion (reinforced by a draft) moved back to Vlamertinghe Chateau the following day. The entire Battalion strength was only 2 officers and 190 other ranks. Inspecting the shattered remnants of the battalion on 28 May, General Sir William Pulteney commanding III Corps commented how sad it was to see so few remaining and emphasised the fact that the Battalion should console itself with the knowledge that those who had gone had “Done their job”. For more information Thomas Stephen Burke’s ‘The 2nd Battalion Royal Dublin Fusiliers and the Tragedy of Mouse Trap Farm: April and May 1915’ is well worth a read. Shell Trap Farm (renamed Mouse Trap Farm) stayed in German hands from May 1915 until its capture at the start of the Passchendaele offensive on 31 July 1917. 2nd Royal Dublin Fusiliers casualties from 24 April – 24 May 1915. Image taken from 2nd Royal Dublin Fusiliers War Diary (NA Ref: WO95/1481) and is reproduced with permission from the National Archives.